In the tradition of Lenin, Stalin and Mao, Ho Chi Minh’s Mausoleum is a monumental marble edifice. Contrary to his desire for a simple cremation, the mausoleum was constructed from materials gathered from all over Vietnam between 1973 and 1975. Set deep in the bowels of the building in a glass sarcophagus is the frail, pale body of Ho Chi Minh. The mausoleum is closed for about two months each year while his embalmed body goes to Russia for maintenance. The roof and peristyle are said to evoke either a traditional communal house or a lotus flower, though to many tourists it looks like a concrete cubicle with columns. The queue, which moves quite quickly, usually snakes for several hundred metres to the mausoleum entrance itself. Inside, adopt a slow but steady pace as you file past Ho’s body. Guards, in snowy-white military uniforms, are posted at intervals of five paces, giving an eerily authoritarian aspect to the slightly macabre spectacle of the body with its wispy white hair. Note that wearing shorts and tank tops is not permitted so dress modestly, and maintain a respectful demeanour at all times; no talking. It’s also forbidden to put your hand in your pockets. Hats must be taken off, and you may also be requested to store day packs, cameras and phones before you enter. Photography is strictly prohibited in the mausoleum. Most of the visitors are Vietnamese and it’s interesting to watch their reactions. 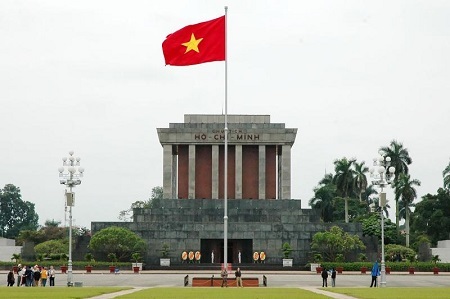 Most show deep respect for Ho Chi Minh, who is honoured for his role as the liberator of the Vietnamese people from colonialism, as much as for his communist ideology. This view is reinforced by Vietnam’s educational system, which emphasises Ho’s deeds and accomplishments. If you’re lucky, you’ll catch the changing of the guard outside Ho’s mausoleum – the pomp and ceremony displayed here rivals the British equivalent at Buckingham Palace.